August 31, 2013 - The Federal Aviation Administration (FAA) plans to hire and train more than 11,700 new air traffic controllers through fiscal year 2021. This presents significant challenges for the Agency, as new controllers can require more than 3 years of training to become fully certified. 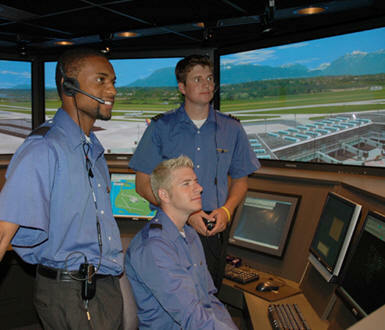 Newly hired controllers must complete a demanding training program that includes learning the basic concepts of air traffic control at the FAA Academy, followed by extensive facility training at their assigned location. Facility training is conducted in stages and consists of a combination of classroom, simulation, and on-the-job training (OJT). After controllers complete classroom and simulation training (if applicable), they begin OJT, which is conducted exclusively by certified professional controllers (CPC), who teach and observe new controllers individually as they control live air traffic at various assigned control positions. The FAA’s goal is to have controllers at en route facilities complete training in less than 3 years, and to have controllers at terminal facilities complete training in less than 2 years. New controllers achieve certification on each position as they move through facility training. After they have certified on all positions within their assigned area, they are commissioned as a CPC at that facility. Training new controllers to the CPC level is important for two reasons first only CPCs are qualified to control traffic at all positions of their assigned area, and second only CPCs certified for at least 6 months6 (at their assigned locations) can become OJT instructors for other new controllers. Given the Department of Transportation’s Office of Inspector General (OIG) previous findings regarding FAA’s controller training program, they found that FAA has taken positive steps to enhance its controller training program, such as creating an Independent Review Panel (IRP) that made 49 recommendations that could significantly improve the controller hiring and training processes. However, almost 2 years after issuance of the IRP report, the FAA has yet to implement any of the recommendations or establish completion timeframes. In addition, OIG found that the FAA faces significant challenges in improving its training program, particularly its goal to reduce training times, as the average training time for new controllers rose by 41 percent between fiscal years 2009 and 2012. Challenges the FAA faces include managing contract training resources, maintaining consistent leadership, measuring the impact of simulators and other training initiatives, and improving staffing composition at complex facilities through controller placement and screening programs. Training new air traffic controllers to replace the large numbers of retiring controllers remains a key priority in maintaining the safety and efficiency of the NAS especially given the challenges this new workforce faces as it transitions to the next generation of air traffic management technology. The FAA recognized the importance of this effort and has taken actions that have the potential to improve its controller training program. However, the FAA needs to track the progress of implementing its initiatives, as well as put in place more efficient mechanisms for assessing the impact of these initiatives on training times, completion rates, and costs. Further steps are also needed to ensure that facilities have the training support resources they need.